Review: New restaurant Kimme's Korean dishes sets it apart. Amoy Street has a curious mix of restaurants. There’s Nouri – known for chef Ivan Brehm’s “crossroads” cuisine, contemporary Australian restaurant Blackwattle, Bochinche’s rambunctious Argentinean flavours and not to mention the slew of Korean barbecue restaurants that line the area. It’s a Modern Asian bistro helmed by Louis Han and overseen by chef Sun Kim of one-Michelin-starred restaurant Meta. Both chefs hail from South Korea and the food is said to be the casual extension of the Keong Saik establishment. Think of how top end luxury labels have diffusion lines where fashion houses have greater leeway to dream up pared down designs. Except in this case, it’s food. 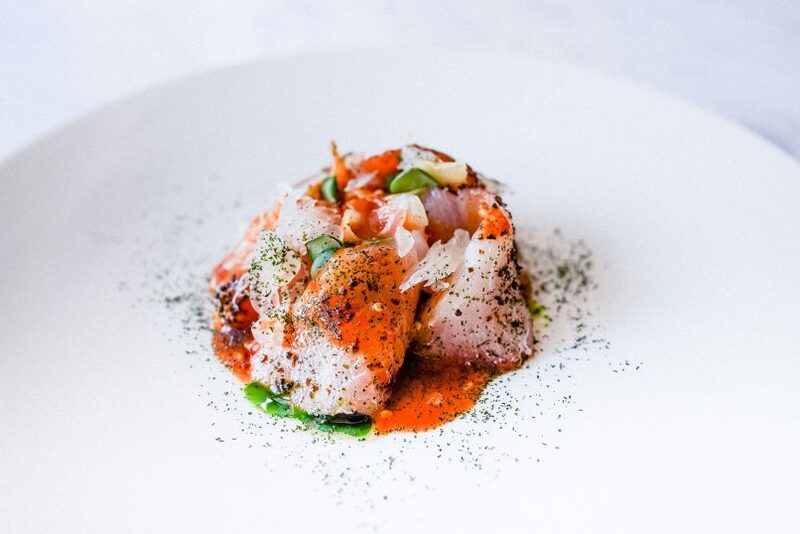 “I can’t cook simple dishes at Meta because it’s a Michelin-starred restaurant and people have high expectations,” said chef Sun Kim when we first published an exclusive on his newest restaurant in the works. 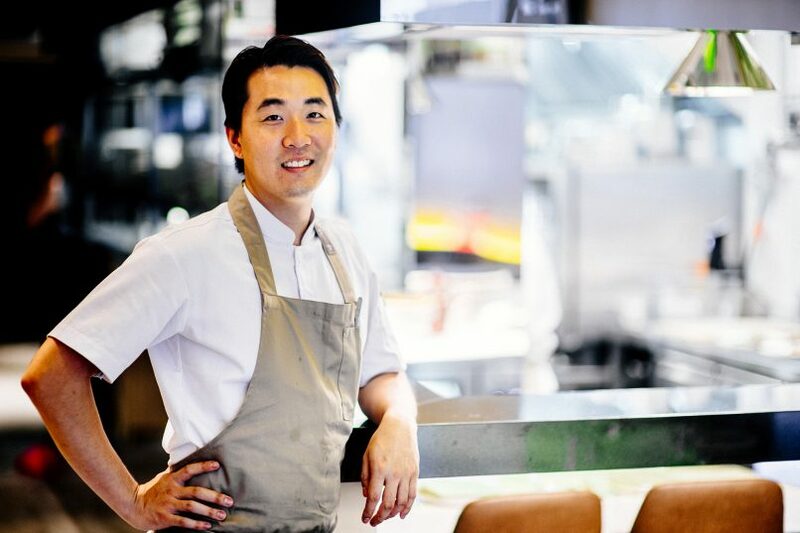 Louis Han, the young head chef of Kimme. While the menu is said to be a little more casual, the space in itself still has an undeniably “Meta” vibe. Sure there are no counter seats where you can ogle at the chefs as they busy about, but the interiors still sport similar shiny black surfaces and an exposed concrete floor. 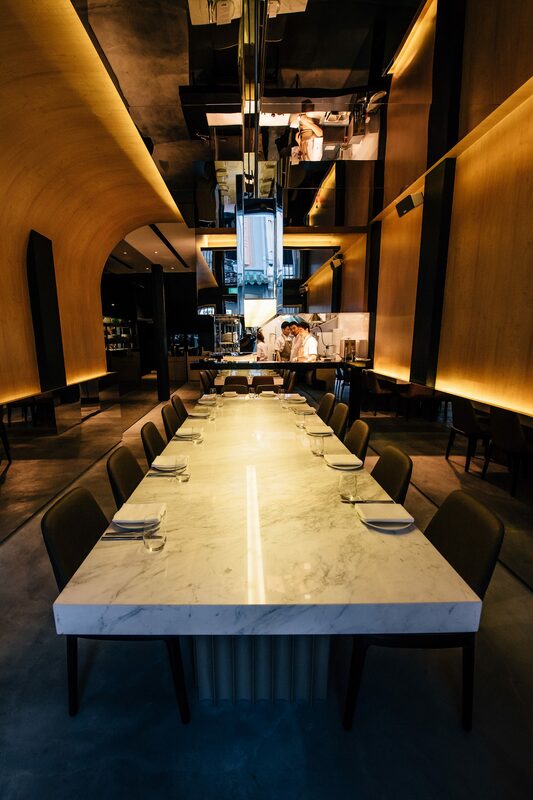 Seating is by way of a marble communal table on the first floor — perfect if you’re coming in a huge group or if you just like chatting up other diners. Otherwise, the second floor of the shophouse space houses regular tables and a bar. If it’s a romantic date or a business lunch you’re on where sitting face to face is preferable, be sure to ask to be seated here. The Modern Asian tag that the bistro wears proudly hardly does the restaurant any justice. In fact, the dishes that bear Korean inflections are not just devilishly delicious — they set Kimme apart in a city already heaving under the weight of so many restaurants. Take for instance the kanpachi sashimi – a contemporary take on how raw fish is savoured on the Korean dining table. Typically, it is eaten wrapped in a sesame leaf with a slice of garlic and gochujang (a fermented chilli and soy paste). At Kimme, it’s given a refreshing spin by way of pomelo and pickled ginger which helps to lighten the heavy base of the chilli paste. Another standout is the wagyu tartare, an expanded version of Meta’s amuse bouche. The dish is otherwise known as yukhoe and resembles the Western version — except the flavours of the Korean avatar straddle the fine line between sweet and savoury thanks to soy sauce and sugar (sometimes fresh pear juice). Kimme’s version is not too different; it’s moreish and the fact that that the kitchens decided to go with wagyu sets it apart from the bevy of Korean restaurants just around the corner (there’s one just facing Kimme). Even the onion and watercress salad served alongside the roasted Brittany pigeon elevates what would otherwise be just another boring bed of greens. It came dressed in a quintessentially korean sauce made from fish sauce, sesame oil and gochugaru (chili powder) – chef Sun Kim’s mother’s recipe. 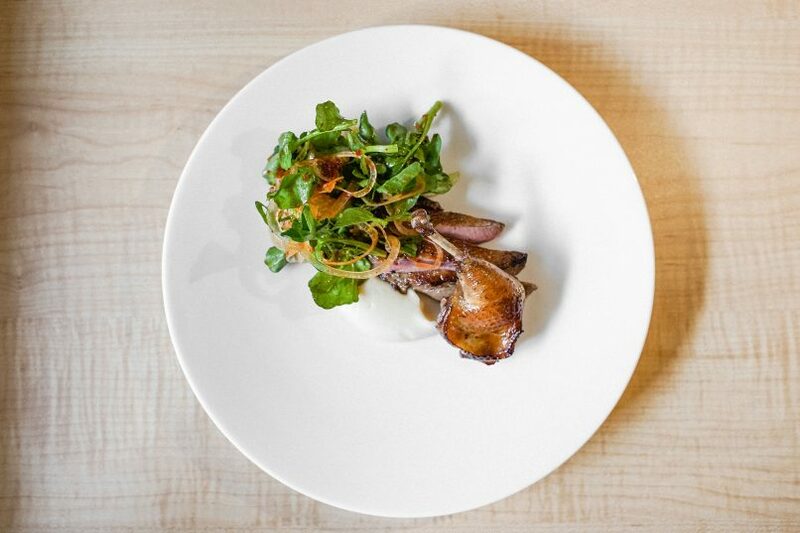 Brittany pigeon with onion and watercress salad. But that’s not to mean that only the dishes bearing a Korean influence are worth ordering. The Spanish prawns with X.O sauce is the perfect example of what a Modern Asian dish should be. Here, king prawns are first roasted until the flesh is sweet and succulent, placed on lashings of artichoke puree and topped with home-made X.O sauce. Just before the meal ends, the kitchens fire the last salvo: a pear and cranberry pie with walnut ice cream. The flavours are rustic and deeply comforting but we’d venture to say it doesn’t quite fit the rest of the menu; it’s neither modern nor Asian. Still, that doesn’t erase its utter banging deliciousness. One can’t help but wonder if it would taste as good had it been deconstructed just to slap on the “contemporary” label. Modern Asian restaurants are a dime a dozen here in Singapore. In 2018, even fine dining temples like Odette and Iggy’s are dabbling in dishes with a pan Asian slant. None so far have dared to wade into Korean territory and for good reason, for it’s a rich tradition that’s fertile with techniques, flavours and way of thinking that not everyone can (or should) execute. This may not entirely be the direction that chefs Sun Kim and Louis Han are particularly looking at for Kimme but it’s one that can certainly spice up our dining scene. Price: $100++ per person with drinks.